A little-noticed fact: for twenty years, including the 1960s period in which he helped invent pop art and presided over New York's most notorious social scene, Andy Warhol lived with his mother. Just in time for Mother's Day, Film Love screens Andy's 1966 portrait film of Julia Warhola, Mrs. Warhol. However much Andy Warhol downplayed his working-class family roots in Pittsburgh, even less known is that this highly American-identified artist and his brothers were the first generation of his family to be born in the United States. His parents, Julia and Ondrej Warhola, were immigrants from the Austro-Hungarian empire, in a region that is now Eastern Slovakia. Ondrej died when Andy was a teenager; in 1952, as Andy began to establish himself as a successful commercial artist in New York, Julia moved to the city to be with him. They lived together until 1972 when Julia moved back to Pittsburgh. 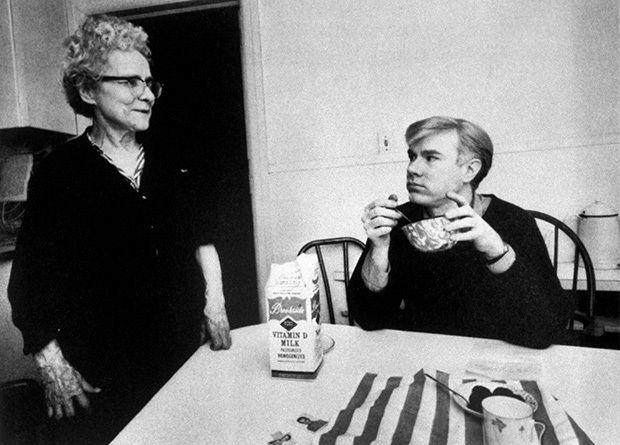 Andy's portrait film Mrs. Warhol was made in 1966, at the height of his filmmaking activity. Situated in the family kitchen in Warhol's Lexington Avenue townhouse, the septuagenarian Julia improvises in the role of an aging movie star with a dark past, bantering with her current husband (played by Richard Rheem) amidst the unspoken possibility that he might meet the same fate as her previous, now deceased, husbands. Several real-life details underlie this melodramatic scenario. Though Julia retained her family name Warhola, Andy had long ago dropped the final "a" from his own name. The film’s title, Mrs. Warhol, thus introduces a subtext about the relationship between family origins and public self-reinvention. Complicating things further is Warhol’s decision to cast young Richard Rheem – who was at the time Warhol's lover – as Mrs. Warhol's husband, further muddying the waters of familial (and self) identification. Customarily for Warhol's cinema, Mrs. Warhol is built from two unbroken, improvised thirty-three minute takes. In the second half, the characters are largely dropped and Julia and Richard Rheem interact with each other tenderly, within the domestic space all three then shared. Richard gets Julia to open up about her European life and her early years in the U.S., while Julia patiently teaches Richard to iron his shirt. Poised on a playful line between documentary of unspoken relationships and the revealing artifice of self-invention, Mrs. Warhol is a poignant tribute to Julia and to motherhood, and a comparatively rare disclosure of Warhol’s feelings on the sustenance and the trials of family relationships. Mrs. Warhol is a Film Love event. The Film Love series provides access to great but rarely seen films, especially important works unavailable on consumer video. Programs are curated and introduced by Andy Ditzler, and feature lively discussion. Through public screenings and events, Film Love preserves the communal viewing experience, provides space for the discussion of film as art, and explores alternative forms of moving image projection and viewing.